*It wis widely reportit that maist o thae killt were ceevilians. The Lebanese govrenment daes nae differentiate atween ceevilians an combatants in daith tow feegurs. **5 tanks war damaged ayont repair ('lastin vehicle kills') frae ATGMs an IEDs, 22 tanks received airmour penetrations, an 52 tanks suffered some form o damage. ither soorces claim 20 main battle tanks destroyed. The 2006 Lebanon War, an aa cried the 2006 Israel–Hezbollah War an kent in Lebanon as the Julie War (Arabic: حرب تموز‎, Ḥarb Tammūz) an in Israel as the Seicont Lebanon War (Ebreu: מלחמת לבנון השנייה‎‎, Milhemet Levanon HaShniya), wis a 34-day militar conflict in Lebanon, Northren Israel an the Golan Hichts. ↑ 2.0 2.1 2.2 "Timeline of the July War 2006". The Daily Star. AFP. 28 September 2006. Archived frae the oreeginal on 2006-09-28. ↑ "PFLP claims losses in IDF strike on Lebanon base". The Jerusalem Post. Associated Press. 6 August 2006. Archived frae the oreeginal on 3 February 2012. ↑ 5.0 5.1 Eyal Zisser (May 2011). "Iranian Involvement in Lebanon" (PDF). Military and Strategic Affairs. 3 (1). Retrieved 8 December 2015. ↑ "Annan: Israel's actions compromise efforts to stabilize the Israeli–Lebanon border". International Herald Tribune. 29 March 2009. Archived frae the oreeginal on 19 September 2015. ↑ "Some 30,000 Israeli troops in Lebanon – army radio". Yahoo! News. Reuters. 13 August 2006. Archived frae the oreeginal on 15 February 2008. ↑ 18.0 18.1 Cordesman et al., p. 110. ↑ Egozi, Arie (1 August 2006). "Israeli Air Power Falls Short As Offensive In Southern Lebanon Fails To Halt Hezbollah Rocket Attacks". Flight International. Archived frae the oreeginal on 4 December 2008. ↑ "State snubbed war victim, family says". ynetnews.com. 30 August 2007. Archived frae the oreeginal on 2 June 2008. Retrieved 13 July 2008. ↑ Sam Ghattas (28 December 2006). "Lebanon Sees More Than 1,000 War Deaths". Associated Press. Archived frae the oreeginal on 6 February 2012. ↑ Con Coughlin (4 August 2006). "Teheran fund pays war compensation to Hizbollah families". The Daily Telegraph. London. Archived frae the oreeginal on 30 May 2007. Retrieved 2 March 2007. ↑ 33.0 33.1 "Lebanon Sees More Than 1,000 War Deaths". usti.net. Associated Press. Archived frae the oreeginal on 6 February 2012. Israel initially said 800 Hezbollah fighters died but later lowered that estimate to 600. ↑ "War Dead Flown to Iran". The New York Sun. 24 July 2006. Archived frae the oreeginal on 4 January 2011. Retrieved 16 January 2011. ↑ Klein, Aaron (24 July 2006). "Report: Iranian soldiers join Hizbullah in fighting". Ynetnews. Retrieved 20 October 2017. ↑ "Lebanon – Amnesty International Report 2007". Human Rights in LEBANESE REPUBLIC. Amnesty International. Archived frae the oreeginal on 17 February 2015. ↑ Moral Dilemmas of Modern War: Torture, Assassination, and Blackmail in an Age of Asymmetric Conflict. Cambridge University Press. 2010. ISBN 9780521866156. Retrieved 20 September 2014. ↑ "Implementation of General Assembly Resolution 60/251 of March 2006 entitled "Human Rights Council"" (PDF). United Nations Human Rights Council. 23 November 2006. Archived frae the oreeginal (PDF) on 17 June 2013. ↑ McRae, D.M; De Mestral, A.L.C (2010-02-01). CANADIAN YEARBOOK OF INTERNATIONAL LAW: 2008. ISBN 9780774859172. Retrieved 20 September 2014. ↑ Yearbook of International Humanitarian Law:Volume 9; Volume 2006. 2006. ISBN 9789067042697. Retrieved 20 September 2014. ↑ "United Nations Interim Force in Lebanon (UNIFIL)". United Nations. 6 August 2009. Archived frae the oreeginal on 10 December 2010. Retrieved 16 January 2011. ↑ "Human Rights Watch raps Israel, Hizbullah, Egypt". Jerusalem Post. 11 January 2007. Archived frae the oreeginal on 8 December 2015. Retrieved 8 December 2015. ↑ BBC News, "UN hails Israel's Lebanon pullout"; retrieved 26 Januar 2007. ↑ "Israel/Lebanon Deliberate destruction or "collateral damage"? 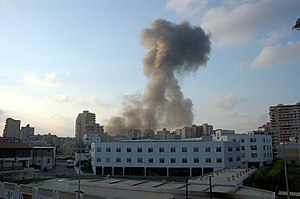 Israeli attacks on civilian infrastructure". Amnesty International. 23 August 2006. Archived frae the oreeginal on 3 January 2007. ↑ Lessons of the 2006 Israeli–Hezbollah War – A. Cordesman & William D. Sulivan. 157p, "Israeli main battle tanks destroyed: 20 (6 to mines, 14 to anti tanks guided missiles-- all Merkava 2,3, or 4)"; retrieved 20 July 2015. This page wis last eeditit on 27 Februar 2018, at 00:15.